Sunderland Harriers, Houghton Harriers and Sunderland Strollers will get their Start Fitness North Eastern Harrier League campaign off the ground on Saturday, September 29. The first fixture for the 2018/19 season will be hosted by Saltwell Harriers at Wrekenton. The league is unique, as it is the only competition in the country with a pack system. Athletes run from slow, medium and fast packs and receive a start from the fast pack with promotion to the faster packs gained by a qualifying performance. There is also a league system in operation with Sunderland Harriers in the First Division of both the men’s league and the women’s league after their women gained promotion last season. They are the only club that have never been out of the men’s First Division. All six fixtures, apart from one, for the forthcoming season were confirmed at the annual meeting at Jesmond. The sport of cross country running is a victim of its own success with rising numbers of competitors putting a strain on the organisation of the league. The difficulties of finding courses around the North East to cater for nearly 2000 athletes and car parking for over 1000 cars is proving difficult. Many good cross country courses have been lost for this reason, including the Sunderland Harriers Farringdon course. But thanks to local clubs and the Harrier League, only one date remains vacant and the committee are confident that this will be filled soon. The Herrington Country Park fixture has been dropped from the fixture list and the date of January 5 is the vacant date. The fixtures are: September 29 - Wrekenton, hosts Saltwell Harriers; October 7 (Sunday) - Druridge Bay, Blyth RC; November 17 - Aykley Heads, Derwentside AC, Durham City Harriers and Elvet Striders; February 9 - Thornley Hall Farm, Blackhill Bounders; March 2 - Alnwick Castle, Alnwick Harriers. Other important fixtures are: The Harrier League Sherman Cup and Davison Shield will be held on October 27 at Temple Park, South Shields. The North Eastern Cross Country Championships are at Wrekenton on the 8th December. The Northern Championships are at Pontefract on the January 26 and the National Cross Country Championships are staged at Harewood House, Leeds on February 23. There were a number of rule changes passed at the AGM and these included: Under-17 Men distances to be amended to 5k. Senior Women gaps between the packs to be increased to 1-15 and 40 secs per mile. Male Veterans to be Over-65 on the 31st August prior to season starting and individual registration fee to be raised to £3. The race order and times have changed and they are: 12.00 Under-11 Boys (1.5k), 12.05 Under-11 Girls (1.5k), 12.10 Under -17 Men (1.5 laps approx. 5k), 12.15 Under -20 and Under-17 Women (1.5 laps approx 5k), 12.20 Under-15 Boys (1 lap approx. 2 miles - 3.2k), 12.25 Under -15 Girls (1 lap approx. 2 miles - 3.2k),12.30 Under-13 Boys (1 lap approx. 2 miles - 3.2k),12.35 Under 13-Girls (1 lap approx. 2 miles - 3.2k), 12.50 Senior Women (2 laps approx. 4 miles - 6.4k), 13.50-Senior Men (3 laps approx. 6 miles - 9.6k). 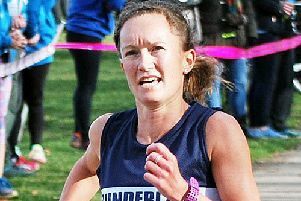 Sunderland Harriers individual grand prix will be held in conjunction with the league and Vicki Cotton will be defending her title. She was the first woman to win the award. The competition is decided on points gained by competing in Harrier League and championship events throughout the season. There is an extra point awarded for team counters. Durham City Harriers have cancelled their popular cross country relays and they have put the following statement on their website - “As a result of organisational difficulties which have arisen allied to a congestion of fixtures, Durham City Harriers regret to announce that they will not be organising their Summer Relays which were initially scheduled for August 16th. “A decision regarding a 2019 Summer Relays will be made by the club in due course. “Could clubs please note that the annual Cathedral Relays will take place as usual in January 2019.